Immediate associations with Jamaica may include the following: gorgeous sunsets, reggae music, and complete and utter relaxation, all of which would be accurate. With so much to offer every type of traveler, it's not hard to see why Jamaica is one of the most popular destinations in the Caribbean for ocean views, villa vacations, and an authentic Rastafarian culture experience that allows visitors to enjoy life on “island-time.” This paradise on the Caribbean Sea also happens to be the birthplace of world-famous reggae singer Bob Marley, as well as one of the fastest men on earth, retired sprinter Usain Bolt. Jamaica has long been a popular destination, and it is also quite safe, as tourism is one of its main industries. As such, the luxury vacation rentals Jamaica has on offer can be found in nearly every price range, ready to cater to any traveller. Jamaica has a hot and humid tropical climate, which means that, year-round, temperatures change only slightly from highs around 90 to lows in the 70s. Jamaica’s rainiest months are in the spring and fall. November-April is generally the best and most popular time to book luxury vacation rentals in Jamaica. Our luxury villas in Jamaica can be found beachfront amid white sands, hillside, seaside, cliffside, with a private pool, and more. Maybe you are looking for bay villas? The villas we offer represent endless options. We offer luxury Jamaica villas of all sizes and price ranges so that everyone has the option of enjoying the wonder of this truly awe-inspiring destination. Choosing the Jamaica vacation rental that’s right for you is easy once you know where you would like to stay. Jamaica has something for everyone. Negril’s Seven Mile Beach is very popular on the island. By day, this family-friendly spot is ideal for a swim, and by night, the many beach bars make for a fun celebration every time. Those seeking stimulating nightlife, lively music, and great dancing will enjoy staying in Negril. There, visitors enjoy live reggae while sipping rum punch on the beach and taking in stunning sunsets. View our Jamaican luxury villas in Negril to get started booking your luxury vacation rental. Jamaica is so much more than parties and live music, however. If you're looking for something calmer, Montego Bay and Runaway Bay are known for striking natural beauty, inspiring waterfalls, and scenic beaches. Our luxury vacation rentals in Jamaica’s Montego Bay make a prime spot for family trips and honeymooners alike, as do our spectacular luxury villas in Runaway Bay. If you are craving a stress-free family vacation, try one of our exquisite Tryall Club luxury villa rentals in Montego Bay. All guests enjoy membership at the Tryall Club, which offers a truly vast and impressively picturesque golf course, and the beach is well-planned for parents and children. If you’re traveling with children, you will adore Mystic Mountain, an eco-friendly theme park in Ocho Rios. Its star attraction is a bobsled ride through the tropical rainforest—inspired by the famous 1988 Jamaican bobsled team. Take in your surroundings at a calm pace on a chairlift that transports you into the forest canopy, providing breathtaking views of Dunn’s River Falls—one of the most popular destinations on the island. Our Jamaican luxury villa rentals in Ochos Rios are the perfect sanctuary after a day at the park. Silver Sands, another popular destination, is located along the North Coast, halfway between Montego Bay and Ocho Rios. Go there to watch the sunrise, the sunset, or the full-moon from the romantic gazeb.o that sits on the end of the Silver Sands Jetty. With its many mountains and rivers, the island is home to several spectacular waterfalls. Jamaica’s limestone construction has naturally eroded over time under the constant flow of water to create tiered steps and refreshing pools. Konoko Falls is a great pick for a more off-the-beaten-track experience. Adrenaline junkies will love Rick’s Cafe in Negril, which has been a popular cliff-jumping location for years; locals and tourists alike attempt back flips and dives, and anyone can watch or join in the fun. A true paradise for hikers and campers, the Blue Mountains are the longest mountain range in Jamaica and a must-see. The island's highest point, reachable on foot, is Blue Mountain Peak, which stands tall at 2256 m (7402 ft). From the summit, both the north and south coasts of the island can be seen, and on a clear day, so can the outline of the island of Cuba. Jamaica has incredible food to satisfy a variety of palates. From sophisticated dining rooms to relaxed beach cafes, eating well is an integral part of island life. You will find the best jerk fish and chicken at local beachfront or roadside shacks. Also, be sure to try Jamaica’s signature ackee and saltfish dish—a typical breakfast made with salted cod, boiled ackee fruit, and scotch bonnet peppers. Enjoy it from the balcony of your very own luxury vacation rental in Jamaica by requesting a private chef. Rum-lovers, of course, have come to the right place and can head inland for a rum-tasting at the 265-year-old Appleton Estate. As Jamaica is an island, most visitors arrive by flying into Sangster International Airport. Though a car rental makes reaching your luxury villa rental in Jamaica easier, it is not necessary if you are not planning on exploring other regions. Many prefer taking taxis or minibuses to get around, and an airport pick-up service can easily be arranged. Our team will work with your personal preferences to arrange any travel logistics as well as find a villa suited to your needs. 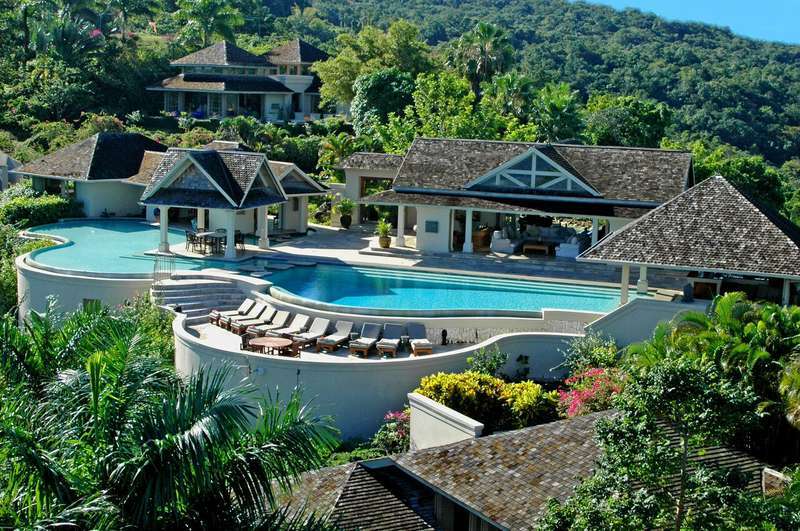 All you have to do is sit back, relax, and enjoy your luxury villa rental in Jamaica. Jamaican dollar (US$1 is equal to about J$101). Tipping is very appreciated in Jamaica. Unless a restaurant adds a 10-15% gratuity charge, a tip of 10-18% will be expected (this should not be confused with a service charge, which is sometimes added to bills but does not go to the staff, in which case a tip is still appropriate). A 10-15% tip on taxi rides is also appropriate. Bag handlers tend to be tipped US$1-2 per bag. For fully-staffed Jamaican villas, 10-15% of the stay is a customary tip and is split among the whole staff. Tips can be given in either US or Jamaican dollars.